WORKING IN HOLOCAUST EDUCATION is no dream job, especially in Hungary. I’m used to hearing these kinds of questions. The truth is, there were even times in the past when I asked them of myself. But after what happened last year, questions like these don’t trouble me as much as they used to. It’s not so much that I found the answer; it’s more like the answer found me. This isn’t a story I can tell by myself, because it was someone else’s story before it became mine. It began in January 1932, in village on the Hungarian countryside called Vállaj, when a farm manager named Márton Kuhn and his wife, Piroska, had their first child. They named him György (Gyuri). Eleven months later, his brother, István (Pista), was born. Gyuri and Pista were very close; they spent most of their time together while their father managed the farm and their mother ran the house. Many years later, when Gyuri gave his testimony to the USC Shoah Foundation, he reminisced about his early childhood: running in from the garden when his mother’s homemade donuts were ready; going to elementary school in the village, then Jewish school in neighboring Székesfehérvár; playing outside with Pista. It was “the good life,” Gyuri said. More than 560,000 Hungarian Jews were murdered during World War II, most of them at Auschwitz. What ended in genocide began with anti-Semitic legislation that violated even the most basic rights, including the right to an education. When Gyuri was denied entry into the secondary grammar school, his parents managed to enroll him in a local high school instead. But in Hungary, lawmakers weren’t the only ones whose hatred of Jews had become overt; other schoolchildren tried to attack him on his way home. Brick factories like the one in Székesfehérvár were the last stop for many Hungarian Jews before deportation, and in May, Gyuri and his family were loaded onto a train. “Being a child, I was unable to comprehend what was going on,” he said. But nobody could have imagined where that train was headed. Márton Kuhn would eventually end up at Dachau. Gyuri, Pista, and their mother, Piroska were brought face to face with Josef Mengele, the SS officer and physician notorious for conducting human experiments at Auschwitz and deciding who would live and who would die. Mengele looked at the boys. “He asked my mother one word,” Gyuri recalled: “ ‘Zwillinge [Twins]?’ My mother did not speak German. Gyuri and Pista were not only close in age; they closely resembled one another and, as was customary at that time, they were even dressed alike. Their mother’s one-word answer to Mengele’s fateful question “meant life for us,” Gyuri said, for the boys were immediately separated for experimentation. Their mother, however, was sent in a different direction. Piroska Kuhn perished at Auschwitz. Gyuri and Pista were taken to the twin camp, but Mengele’s mistake was almost immediately discovered. When they were being registered, each boy gave his true date of birth; the adult inmates in charge of registration stared at them in “total bewilderment.” One of them was a 28-year-old man named Ernő Spiegel. The boys survived Auschwitz and were reunited with their father. In 1956, during the revolution, Pista left Hungary for the United States and settled in Oklahoma City, where he studied to be an architect. In 1962 at the age of 30, while working at a hospital to finance his university studies, Pista became ill and died. Gyuri remained in Hungary after the war. After marrying in 1960, he and his wife, Ágnes, had a baby girl. They settled in Budapest, where Gyuri and Ágnes still live to this day. He has posttraumatic stress disorder, and he believes that what he experienced as a child—what history calls the Holocaust—had an effect on more than his health. Gyuri’s testimony is one of thousands that people can watch at Central European University (CEU), in Budapest, where the Visual History Archive has been available to the public since 2009. Last spring, a colleague at CEU forwarded an email sent on behalf of a doctoral student at Royal Holloway, University of London. It was an email about a research question. The question was simple enough, and my colleague had already answered it, so why forward the message? I read further. The doctoral student was conducting research on a Hungarian Jew from Munkachevo, who supervised male twins at Auschwitz. I read the name of the Jew, Ernő Spiegel and sent a reply to the translator, who had written on behalf of the doctoral student, and in her subsequent email, she asked if I had information about any inmates in the camp besides Ernő Spiegel—specifically, Gyuri Kun and his brother. I told the translator that Gyuri Kun is my father. When the doctoral student, Yoav Heller, learned this, the next email came directly from him. He said he’d had my father’s story translated into English; he knew the tiniest details of what had happened to him and his brother at Auschwitz. Heller continued, saying that he organizes an annual summer trip to Poland for 120 young Israelis, who all learn about Ernő Spiegel and those he helped saved, including my father. 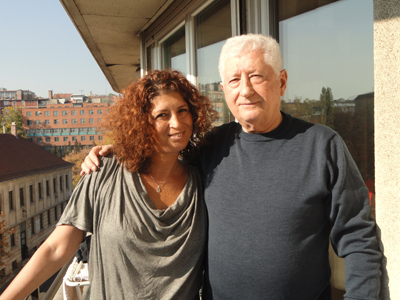 Nine days after our email exchange, Heller came to my father’s house in Budapest. The two of them sat down together, and I translated. I don’t think I’ve ever seen anyone speak to another person with such genuine respect. This was the same incident my father had described in his testimony; in that moment, Spiegel had saved my father’s life. I could be teaching English, or running a school, or doing any number of things to make a difference instead of working in Holocaust education. But now I understand that nothing happens by accident; our lives are interwoven within a mosaic-like, larger context. My father’s story is part of Ernő Spiegel’s story; their stories are part of their children’s: Judith and Israel Spiegel’s, and part of mine. There’s more to be found in this larger story than mere poetry; for me, there is also purpose. I owe something to Ernő Spiegel. I owe him my father’s life, my own life, and the lives of my children. I owe him our future, and I am fortunate enough to be in a position to pay some of this debt by being an educator who uses the “voices in the archive”—voices like my father’s—to do so. Andrea Szőnyi is senior international training consultant and regional representative in Hungary for the USC Shoah Foundation. She is also the director of Zachor Foundation for Social Remembrance, a nonprofit educational institution working in holocaust and human rights education in Hungary. Szőnyi graduated from Eötvös Loránd University, Budapest, with degrees in English and Russian languages and literature. She also received a degree in cultural management. Szőnyi worked for years as a high school teacher. She is the author of several educational materials and the editor of publications and has also published several translations. She is a Holocaust Education Fellow of the Imperial War Museum in London. This article first appeared in the Summer 2013 issue of PastForward, the Institute's digest.